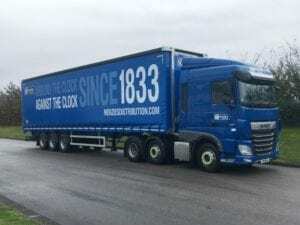 Menzies Distribution has acquired 27 new 44-tonne DAF XF tractors and 42 single-deck and six double-deck Montracon curtainside trailers for a new retail contract. The vehicles have been supplied by Fraikin as part of a five-year contract hire agreement. Menzies transport and assets manager Lee Anderson said: “This key contract began in December 2018, so we thought getting 75 assets to seven locations across the UK in time for the peak Christmas season was going to be a very tall order – we couldn’t have been more wrong, everything went like clockwork. “Customer contracts such as this one are the lifeblood of our business, so guaranteeing uptime across the fleet is critical,” said Anderson. Fraikin now supplies some 70 per cent of Menzies’ fleet of 600 vehicles. It will manage all repair maintenance and servicing of the vehicles through its national network of workshops and third-party repairers to ensure the work is carried out near Menzies’ own depots.